Among the issues pressing on the mind of French President Emmanuel Macron as he prepares for a state visit to Washington on Monday is what he describes as a "civil war" between the forces of democracy and authoritarianism in Europe. In a recent speech to the European Parliament in Strasbourg, Macron called on the European Union to resist the siren song of populism. "There is a fascination with the illiberal and it's growing all the time." Macron's comments come after euroskeptic populists won elections in Hungary and Italy, and as the EU confronts Poland's right-wing government over the rule of law. "I reject this idea that is spreading in Europe that democracy would be condemned to powerlessness. In the face of authoritarianism that everywhere surrounds us, the response is not authoritarian democracy but the authority of democracy," Macron said. Many on both sides of the Atlantic are pondering the dangers of illiberalism and autocracy — especially in Central and Eastern Europe — and what it might mean for the future of the continent. 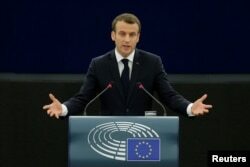 French President Emmanuel Macron delivers a speech before a debate on the Future of Europe at the European Parliament in Strasbourg, April 17, 2018. In front of an audience of Washington policy experts at the Center for Strategic and International Studies, former Polish Foreign Minister Radek Sikorski challenged the view of Hungary's populist prime minister, Viktor Orban, that a democracy "is not necessarily liberal." Sikorski said that while there can certainly be democracies where non-liberals win, populists are distinct. "In order to win, populists first need to focus on something that is popular and they did. 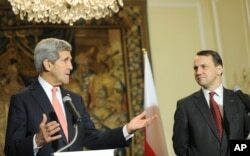 They focused on an issue that was at the height of public attention in all of Europe, namely migration," Sikorski said. Orban, whose Fidesz party and its allies won a sweeping election victory earlier this month, said the outcome gave him "a strong mandate" to restrict migrant rights and push for a European Union of independent nations rather than a "United States of Europe." Charles Gati, professor of European and Eurasian Studies at the Johns Hopkins School of Advanced International Studies in Washington said that by and large, the Eastern and Central European countries that have been admitted to the European Union are on a good path. He did, however, add that "backsliding democracies" would not be the right way to describe what is happening in Poland and Hungary. "They are either authoritarian, or semi-authoritarian regimes that maintain the facade of democratic processes." Heather Conley is a senior vice president at the Washington-based Center for Strategic and International Studies. She said many factors may be contributing to the current trend in Europe. "Weakened opposition and then policies and structures that purposely reduce and weaken that opposition, that's really for me a hallmark of this trend toward illiberalism," she said. Central European or global trend? Sikorski warned against applying regional labels when talking about populist or illiberal tendencies. "This is not a Central European phenomenon. This is a Pan-Western phenomenon," he said. In its latest issue, Foreign Affairs magazine asks the question, "Is Democracy Dying? — A Global Report," which analyzes the issue not only in Europe, but the United States, China and other countries. According to the magazine, "Some say that global democracy is experiencing its worst setback since the 1930s and that it will continue to retreat unless rich countries find ways to reduce inequality and manage the information revolution." For David Frum, a senior editor with The Atlantic magazine, democracy is better seen "as a dimmer switch, rather than a light switch, not on or off but brighter or darker." "If it's possible to become a more liberal democracy in one direction, in the same way you can become gradually a less liberal democracy, without going through the full overthrow of your state," he said. Sikorski said he worries that illiberal tendencies in formerly communist countries may have larger consequences. "We have reawakened stereotypes about the region that were on the way to being buried and we have contributed to the decline in the willingness of Western Europe to consider further Eastern enlargement." 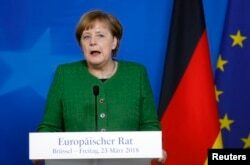 In an open letter to German Chancellor Angela Merkel, academics, writers and activists criticized her for not standing up to Orban's attacks on Hungarian democracy. Sikorski, however, said the EU cannot do much because the whole confederation is based on the idea of mutual trust among institutions in individual member countries. "If this mechanism of trust is broken, then the consequences are very profound for the whole union." The EU may have important leverage. The last seven-year budget granted Poland nearly one-fifth of the EU's cohesion funds and negotiations over the next budget begin in May. So, under pressure for its controversial changes to the legal system, which critics say put judges under the control of the ruling party, amendments have been submitted to parliament to reverse some of those revisions. Gati says the way to counter illiberalism in Hungary is through voting. "I think it's possible that next year when there are municipal elections, Budapest will go to the opposition," he said. And Frum said it is important not to pathologize Central and Eastern Europe. "There is a flu going around the neighborhood; some people have got a much worse case than others and some people have weaker immunity than others, but do understand that it's the same flu that we are all getting." Whether this is a flu or an epidemic, one thing is for sure: there are no clear prescriptions.